JORDAN McGHEE is like an elephant: He never forgets. It’s a rather useful trait in weeks like this. While some Hearts fans have become indignant over a Scottish Cup defeat by Hibs, McGhee is mindful of the bigger picture. He remembers the utter desolation of his club lapsing into administration when he was just 16. A year later, he suffered as a Hearts team dominated by youth academy players was relegated. Those difficulties allow him to put Tuesday night’s events into perspective. Hearts have overcome far greater adversity recently than losing a Scottish Cup match, even one against their biggest rivals. The opportunity to qualify for European football remains very much alive in their first season back in the Premiership. Internally, the club is stable and growing steadily once again. Travelling up the M90 to Tannadice tomorrow, it is those thoughts which will occupy McGhee’s mind. He and colleagues like Callum Paterson, Sam Nicholson, Jamie Walker and Jack Hamilton have gone through administration, relegation and promotion together. 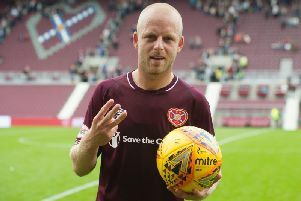 They are now determined to sample success at the top level and propel Hearts into the Europa League by finishing at least third. “Tuesday still hurts, it hurts very much,” admitted McGhee. “Losing any game, but especially such a big occasion like a derby, hurts that wee bit more. I think it will take a few more days for the boys to get over it. There’s no point in dwelling on it. “The gaffer came in and spoke to us. He said: ‘It’s happened. Be disappointed and be gutted that it’s happened, but we’ve still got a big season ahead of us and we still need to finish as high up the table as we can’. That was always the aim, to try and get into the European places. We’re in a good position at the moment so we just need to keep picking up points through to the end of the season. “Obviously, that’s us out of both cups now so there’s a bit more hunger to win games and succeed in the league. All the boys in the dressing-room have that. The management team have it as well and it rubs off on everyone. The defender is sitting on a bench chatting inside Hearts’ Riccarton training ground. He has seen enough benches to last his entire career and is praying he isn’t returned there by head coach Robbie Neilson tomorrow. With Alim Ozturk suspended he started in his preferred centre-back role against Hibs. The club captain is due to play tomorrow and McGhee is concerned he may drop out. “I realise 19-year-olds don’t often play centre-back,” he said. “I think the only one is John Stones at the moment but he’s in his 20s now. He’s playing next to Phil Jagielka in a really good, experienced Everton team. It makes your job far easier when you’ve got players like that around you and that’s who you learn from. I need to be patient and continue to learn from experiences like Tuesday night. I know that next time I need to be a bit more hungry for blood. “Everyone trains hard so when you get a chance, you need to take it. I feel as if I’ve done that. I’ve done well when I’ve come into the team but I’m capable of even better. It’s just whether the manager keeps showing faith in me. That’s what you need. In his favour is a sterling display in Hearts’ 1-0 win on their last visit to Tannadice in October. “I came in when big Callum was suspended. I played right-back and did really well. I’ve played pretty regularly since then. It’s always frustrating when you drop out. You always ask yourself questions about why you’re not playing and you ask the manager as well. He just says you need to be patient. That’s what I’ve done, I’ve got my chance and I’ve taken it. McGhee has shrugged off the disappointment of a collapsed loan move to Middlesbrough on transfer deadline day. That may resurface come the summer but, for now, he is focusing on Hearts. “The Middlesbrough thing came up and I thought I might be a little bit out of the picture here because I was almost away. Robbie spoke to me the day after it and told me I was still in the plans. I was delighted to hear that because I still wanted to play for Hearts. It was important for me to hear that from the manager straight away.